Our product range includes a wide range of motorized barrier gates. We are a leading supplier of a sustainable quality Motorized Barrier Gates. 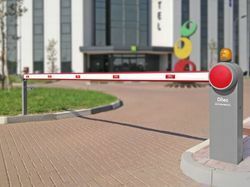 Motorized barrier gates are very useful for traffic management, parking and security. It can be connected to the toll collection system, automatic parking system card access system. Available in various models and boom length. Looking for Barrier Gates ?